Become a Professional, stand out from crowd and Earn more Money with Fast, Secure, Reliable and affordable Dedicated Servers! Together we're growing stronger! Go with SpeedoServers.com getting your Dedicated Servers or VPS, Grow Your Business fast, secure and less expensive! We're always moving forward along with the new IT technology, just to meet all possible requirements of our customers. You can choose your control panel when ordering your server. However, choosing cPanel-WHM would be best especially for people who don't know much about managing web-servers. With any server, you will get at least 100GB free backup space where you can backup your data. Anyway, we will do it for you at least once per week, so your data will never be lost. When ordering you server you got the option to chose any available control panel: cPanel-WHM, Parallels® Plesk Panel 11 or Webmin (available for LAMP ). We can manage at no charge the cPanel-WHM. However, we do recommend cPanel because over 50% of its functions are self-explanatory and easy to understand even if you are not a qualified it/ Web-server System Admin professional. Having our servers and your rented servers in best state-of-art technology data-centres and using Intel processors plus software like CloudLinux or LiteSpeed we got them running safely and really fast. Our Technical Support Team is here for you 24/7 with the online Ticketing system. When you need help with your server or with any domain (website) hosted on your server, all you need is to open a ticket and we will do our best to sort it out as soon as possible. So any web-hosting related problems affecting the functionality of your domain (website) will be on us to fix it, you don't have to worry about it. Intel®C2750 Avoton 8 Cores & Thrd. 1TB SATA3 or 120GB SSD. No Raid. 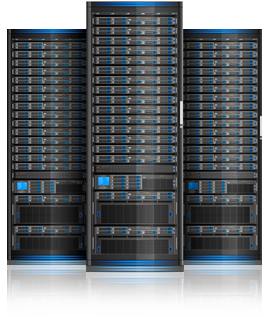 In the Web hosting industry, a dedicated server refers to the rental and exclusive use of a computer that includes a Web server, all related software installed and connected to the Internet. The dedicated server basically means that the server is not shared with other companies, entities or individuals. That computer/web-server is housed in some data-centre where a few engineers are working there 24/7 to ensure that all web-servers are up and running. The web server can be configured and operated remotely from any computer and any worldwide location. A data centre is a large group of networked computer web-servers, usually used by IT/Hosting companies or other organizations for the remote storage, processing, transfer, distribution, manage and disseminate massive amounts of data over the Internet. The security and reliability of the handled data is the top priority of any data-centre facility, that is why they are 24/7 monitored by CCTV, equiped with 'Uninterruptible Power Source's (UPS) – battery banks, generators and redundant power sources. Data-Centres are also under permanent 'Environmental Control', the racks holding all computers (web-servers) are placed in computer rooms air conditioners (CRAC), heating, ventilation, and air conditioning (HVAC) systems, and exhaust systems. Modern Data-Centers are 'GreenIT Best Practice' and ECO awarded, using innovative and modular building concept, environmentally friendly direct free cooling, the use of power-efficient components, as well as the use of special measuring and control engineering. Because of the necessity of maintaining and housing the dedicated servers, the cost associated with running them it's a bit higher than a VPS or other web hosting solutions. However, the stability, speed and security of dedicated servers are unrivalled. If you can afford to pay the minimum amount of £35/month for having your business online running safe, fast, secure and smooth go for it, in the long run it will pay off. Don't get cheap and have your data, lost or hacked, don't take the risk of having your website down for days or your important business emails undelivered. My huge e-commerce website http://bby.ro/ needs lots of resources and disk space (over 250 GB), so the necessity of a dedicated server occurred. I got my first dedicated server from a giant web hosting company and it was alright. Anyway, just paying over £400/month was the only thing not quite right after finding on speedoservers.com the same server's features for half of the price. Saving every month over £200 is not much money, but in the long run... you tell me. We got a few websites and found in the end best solution of having them all web-hosted on a very cheap VPS from speedoservers.com - Happy Days now !